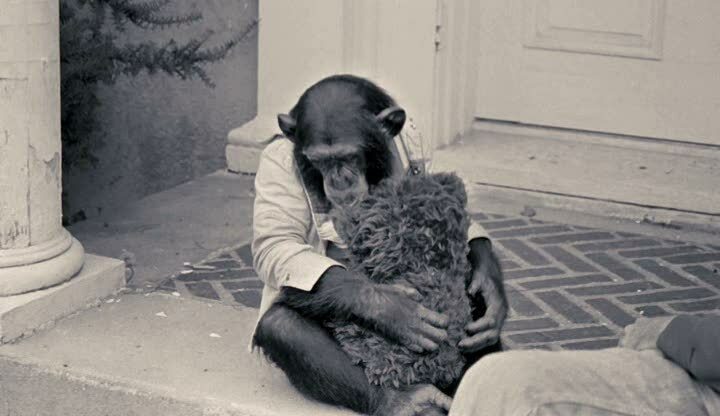 Project Nim (2011), directed by James Marsh of Man on Wire (2008) fame, gives to us the life of Nim Chimpsky, the chimpanzee at Columbia University that was being trained to communicate in sign language, as narrated by Dr. Herbert Terrace (the head of the project) and his team of trainers. We see the animal being taken away from his mother by force, brought up along with human children at one of Terrace’s friends’ home, transferred back to the university, sold to a drug-testing facility and, finally, to a private ranch. We witness the devastating tragedy of Nim’s life, as he is deracinated, trained for years to become human-like only to be expected, subsequently, to behave like chimpanzee. Throughout, there is an ambivalence based on the nature versus nurture question that we experience: Is Nim’s rapid learning curve an indication of the dominance of social relations in shaping communication or is his random acts of violence a clinching proof for the presence of an innate animal essence? The interviewees describe their relationship to Nim in very human terms and one wonders if some of it is not the projection of their own anthropomorphic understanding of the animal’s behaviour. Consequently, Nim becomes something of a MacGuffin that everybody is talking about, but no one knows what it exactly is. The film’s sympathies clearly lie with the animal, to such an extent that it refuses to see the complexity of the situation. Abstracting scientific research as animal cruelty, the film fails to take into account the more pressing issues that are being addressed by such projects. To add to this gross simplification, Marsh’s questionable fictional restaging of facts and regular use of unrelated footage in order to prevent the film from becoming a talking-heads documentary betrays a lack of faith on the material and an unwarranted fear that a straightforward presentation would be ‘uncinematic’. I watched this just recently and I’d say that it’s pretty uncinematic even if he tries hard enough. It’s still interesting to see, and the chimp’s story is engaging enough. We are miles apart on this film Srikanth. The “complexity” you speak of should NEVER mitiagte against what is clearly an eventual strain of pathological cruelty, which followed painful indifference and an air of arrogance. In light of this basic human injustice, there can be no obsfigation, nor protests of gross simplification. The very nature of our civilization and self-sustaining prioritization precludes in many instances the humanitarian pre-requisites that maintain the natural order of nature. My perceptions did not include any “questionable” restaging of the facts, not did I feel Marsh had any kind of a deliberate agenda in the way he opted to present his film. I think the witnesses who comprise the fabric of this story of human failings more than ably corroborate the core material. I could certainly point to the spectacular reviews the film has garnered here and abroad (probably the best of any documentary this calendar year) but I know that would a cheap shot, and I respect you way too much to play that card. But the point I wanted to make is that on the central argument you pose here -that of more than meets the wye- just about nobody has concluded that the people responsible for these attrocities were somehow misunderstood. The great irony of the release of this film, was that it came out within a week of the newest PLANET OF THE APES film, a fictional feature that almost incredible, broached some of the same issues as PROJECT NIM. Anyway, as always I applaud you for your honestly and superlative writing, and wish you and yours the best year ever in 2012. Sam, I knew that demanded an explanation there. There is no doubt that this is a cruel method and should be done away with as soon as possible. But the facts that such testing has helped cure millions of human lives across the planet and that we haven’t yet proceeded to a phase where the philosophy of greater good (“self-sustaining prioritization” as you sharply put) can be done away with completely. That is the tragedy of the situation. I’m not denying the cruelty towards animals at all, just pointing out that the film does not want to look towards this tragedy that humanity is up against. Now, there would be a great film. Happy New Year to you and your family, Sam. Hope the new year brings the best.